Debut album by Bournemouth band. For fans of Dylan, the Byrds, Teenage Fanclub and REM, melody & musicianship and English Americana. The promise of their debut is finally realised says Ged Babey. There is a time and a place for listening to some albums. All the Ghosts is just right for a sunny but cold Sunday afternoon at home. It’s gentle, walking pace rock’n’roll to ease the slight hangover from last night as you potter around. This is an absolute classic album from out of the blue. Like REM’s ‘Out of Time’ it’s out of step from current trends and out on it’s own. Mature, melodic, mid-paced undemanding rock’n’roll but with so much idiosyncratic charm, breezy optimism and romantic melancholy that it captivates with a gradual subtlety. English Americana is a geographically confusing tag, but points to what to expect. Gentle rock guitar, hints of country, a Byrds, REM, Kinks kind of melodic classicism. Walking pace songs rather than driving music. And a feel of slightly stoned, smiling to yourself psychedelia. Frontman and singer Lance Riley is described (by Nick Churchill) as ‘an English classicist in the mystical tradition – all Mad Hatter escapades with happy/sad tunes and lyrics that succour the soul and raise the spirits’. Lance Rileys vocal style is a major part of Dumb Poets. He has a way of enunciating, which combined with the timbre is out-of-the-ordinary. It’s a bit Dylan, a bit Edwyn Collins or Peter Perrett? Steve Harley? : in an all-or-none-of -the -above kind of way. ( I’m not doing a great job of explaining this am I?) It struck me later that if Marc Bolan had lived another twenty years or more, maybe this would be how he would’ve sounded? The late-Sixties influences manifest themselves in such a way that you seem to hear bits of Teenage Fanclub, the Charlatans and even Oasis in the songs: which is a audio trick of the light as they must’ve been influenced by the same canon. The cynical amongst you may see a warning signs saying Dadrock and Heritage Rock – and you’d have a point…but Dumb Poets sound so fresh, bright-eyed, so oblivious and yet fully-focused on making the very best album they can, that the results are just sublime. They odd Dire Straits-ism can be forgiven because the rest of the album has the studied cool of Suede, the songwriting ability of the Pretenders and the psychedelic gait of the Creation. Yet after a few listens; its the sound of Dumb Poets. Forty years of influences and as much experience filtered into a last chance at appreciation and recognition. At least half the songs on All the Ghosts are radio-friendly hit-material that could slot in with drive-time classics. Wildflower would be a guaranteed hit were it not a little bit to close to Near Wild Heaven for comfort on the chorus. Lotus On the Wire is my personal favourite with it’s Suede-like feel and motorcycle trip to Soho. Shadows and Downstream pull out of blues-rock-chug territory due to the vocal and lyrical quirks – all spring-time Bohemia, lightning trees and Belgravia gardens. Country Girl is possibly the song which a lot of people will regard as the albums standout on first listen as you’d swear you’ve heard it before, even though you haven’t. 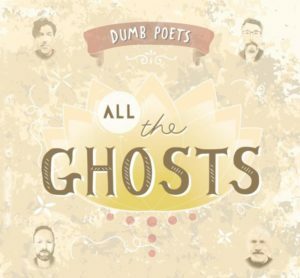 All the Ghosts has an autumnal feel and beauty that will go down well with Bob Harris-types and muso’s but will appeal to anyone and everyone who likes a bit of real class and style in their guitar music. The very best of British Americana – tradition and tunes, songs of joy and love, crafted and performed well with a lot of bohemian style.